What You Need to Know About Concussions | Kid Reporters' Notebook | Scholastic Inc.
Click below to see Lilian’s interview with concussion specialist Kevin Walter, M.D. There is an increasing amount of awareness about the dangers of concussions. 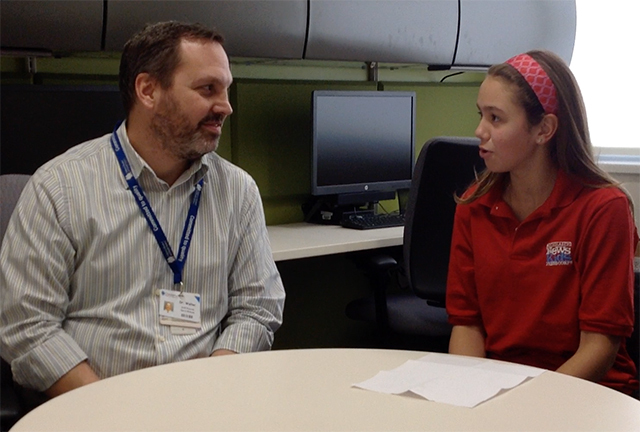 I recently spoke with concussion specialist Kevin Walter to learn more about the challenges that the injury poses to kids. Dr. Walter is program director of pediatric and adolescent sports medicine at Children’s Hospital of Wisconsin. He explained how a concussion happens. Kids who suffer a concussion—whether in a game or merely by falling—can experience headaches, ringing ears, and difficulty balancing. The ability to concentrate and remember things also can be impaired. You don’t have to get knocked out to suffer a concussion. The severity of the injury can vary from mild to severe. Increasing awareness about the dangers of concussions has led more coaches to seek treatment for young athletes. Increasing awareness about the dangers of concussions has led more coaches to seek treatment for young athletes. The number of concussions being reported has risen in the past few years. More kids are playing sports, and there’s a greater emphasis on recognizing concussion symptoms and treating them. Research on professional football players who suffer from multiple concussions has demonstrated that it’s important for kids to be screened carefully after suffering any type of head injury. It’s also important to take a break from physical activity after sustaining a concussion, to allow the brain to heal. If an athlete suffers a second concussion before the first one heals, he or she may be at risk for post-concussion syndrome. The symptoms could then last for months instead of weeks. Don’t assume that just because you’re wearing a helmet, you can’t get a concussion. Walter explained that helmets are not designed to prevent concussions. Wearing one properly, however, can prevent other injuries to the brain. Some doctors, including Walter, suggest baseline concussion testing for all athletes. Before participating in a sport, you do a series of tests measuring your balance, reaction time, and memory. Then, if you do get a concussion, it will be easier for doctors to determine when you have healed fully. Once a concussion heals, a kid’s baseline numbers typically return. I underwent mock baseline testing at Children’s Hospital. First, my balance was tested. I was asked to stand on both feet, then one foot with my eyes closed. I then was asked to do the same thing while standing on a foam pad. Each time I touched the ground or wall or opened my eyes, my score was reduced. Next, a computer test measured my reaction time. Digital cards flipped face up on the screen, and I had to click whether they were red or black. Such a task becomes harder for kids with a concussion. But there is no right or wrong on these tests. They simply allow doctors to establish what is normal for you. If you do get hit in the head, be smart, and let someone know. It will be safer for you in the long run.